All Athletes are required to perform in the correct Centre Uniform. To comply with Little Athletics SA Uniform regulations which come into effect this season, the Committee have made the decision to update our Uniform. 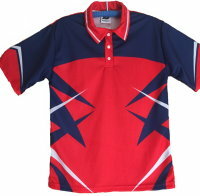 The old uniform had been in place for 10 years and the new top is made from better material, updated look and most importantly, is compliant with the association’s regulations. We are also looking to introduce a new style running short in the coming weeks, although we will still continue to carry the existing style shorts. There will not be any change to the hats and socks. We understand that many families purchased new shirts last season, so we will be subsidising the cost of the new shirt, which will be $20 for returning members. Athletes should wear correct centre uniform at all home and away meets after registration. This is vital at Association and Regional events, where failure to do so will result in disqualification. 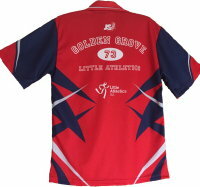 The registration number is to be attached to the centre front of the shirt and the age group badge on the top left chest area. Athletes must wear shorts, sports briefs or two-way stretch above the knee shorts (commonly referred to as bike shorts or skins) in their centre’s approved colours. Athletes may wear a second pair of shorts underneath their Centre shorts. If worn, they must be plain and the same colour as the approved Centre shorts colour or black, and conform to the description above.. TINY TOTS do not need to wear GGLAC uniform and may wear generic dark/navy blue shorts and red polo. If you choose the generic clothing option, the registration, age group and Coles badges must still be affixed to the polo top as per the image. HATS MUST BE WORN AT ALL TIMES WHEN NOT ACTIVELY COMPETING. Please also refer to the LASA Uniform Regulations. Do you have good quality GGLAC uniform items that your child has outgrown or athletics shoes or equipment and would like to sell or giveaway? We now have a Secondhand Items Facebook group for you to advertise your items to sell or giveaway. Likewise if you are looking for secondhand uniform or shoes, maybe you can find what you are after in our Buy and Sell Facebook Group.